Silver Birches ready for the 2013 July 4th festivities. 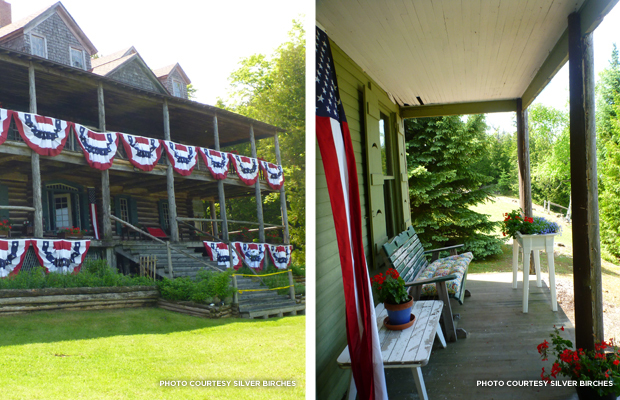 "They say Mackinac Island is the crown jewel of Michigan," says Liz Ware, a Chicago native who is spearheading the renovation of Silver Birches, one of the many historic buildings at the popular Mackinac Island summer colony at Lake Huron, Michigan. Built in 1906, Silver Birches alternated between use as a private rental property and a public resort, lodge, and girls' camp. Its pristine Adirondack style signified health and wellness, drawing generations of visitors to its dock, pool, and cottages. "I saw the property last summer for the first time when I was on a boat going around the island," says Ware. "I saw it from the water and I thought, 'What is that place?' Afterwards, I got on my bicycle and rode out to the property. I walked to the back of it and I saw its architectural style and the view of the lake. Then I just cried because it was just so beautiful." Mackinac Island's pride in preserving a variety of archiectural landmarks adds to the locale's natural, relaxed atmosphere. Silver Birches is one of many gems situated within the National Historic Landmark, but it hasn't been used as a public lodge since the 1960s. "Silver Birches is the last property, out on its own, by itself, that hasn't been restored," says Ware. "It was in such great disrepair that people actually thought it might fall over." 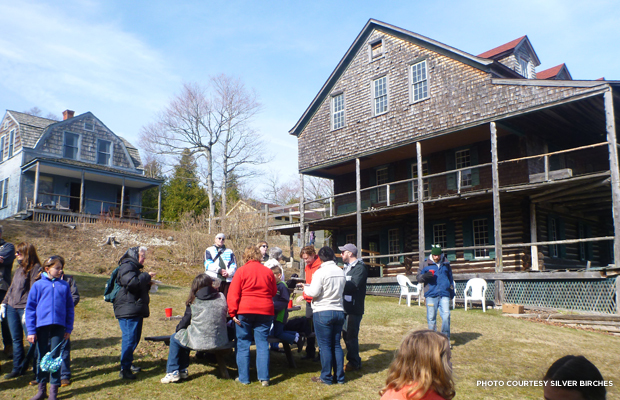 Friends, family, and team members gather around for the pre-renovation open house in May 2013. 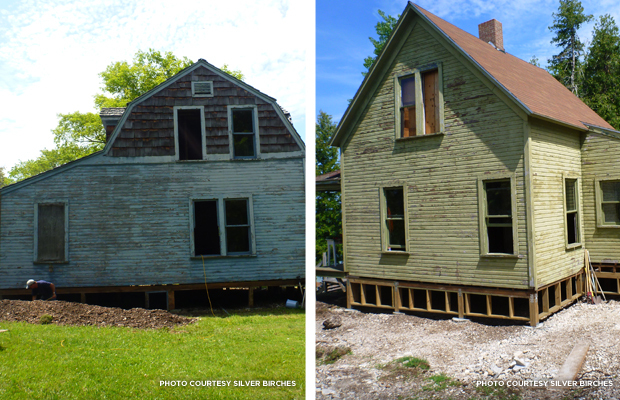 Ware knew she needed to take action, so she bought the dilapidated building. Then she and the Growing Silver Birches team -- comprised of her family members, friends, contractors, and architects -- came up with plans to renovate the lodge into a rental property so that future guests can enjoy the lodge's magic. "The first step is to redo the cottages, and right now we're doing the Master Plan for the property," says Ware. "Not all the rooms have wiring in [them] and we have to put in some sort of heating or air conditioning. So the challenges of doing that and being careful to not destroy the interior are pretty great." Changing the Silver Birches' zoning from residential to business will be a first for the Island. She is working closely with the city leaders, the planning commission, and her team to produce a plan that will set firm rules for the property's reservation and continued use. "We want to make a property that is a financially viable business, but we don't want to overdevelop it because it will ruin the character and integrity of the land," says Ware. Mackinac Island's non-motorized vehicle regulation also presents difficulties in Silver Birches' renovation process. "The property is located directly half way across the island and it's the furthest place from downtown," says Ware. "So not only do we have to get materials to an island, we have to get them to the property by horse which makes it extremely challenging -- but not impossible!" The yellow and blue cottages houses are two private guest cottages that Ware hopes to have updated first in the renovation process. The Island's variable weather is also sometimes a battle within itself. "You have to ride your bike here," says Ware. "If there's inclement weather, you have to ride your bike here. If it's cold, you have to ride your bike here. One time it was 33 degrees out here, raining, and the wind was blowing 20 miles an hour at our faces. Everyone on the team had to ride 3.5 miles in the rain to get here and into a place that does not have any heat." Despite these difficulties, Ware and her team are enjoying Silver Birches as much as they can before the lodge has its grand opening for the public next year. "This year -- this summer -- the house is ours. We've gotten to the point where it is almost livable, so we'll have it here for the summer for our family to enjoy it," says Ware. "It's coming back to life."